One question we frequently get asked is seemingly obvious, but surprisingly complicated: Why are the technologies used for refrigeration and air conditioning different? It seems simple, right? Your refrigerator manages to keep foods cooled or frozen with minimal effort, running almost constantly – why doesn’t your AC work the same way? The word refrigeration is supposed to mean the removal of heat to leave things chilled, but we use it quite differently when referring to refrigerators themselves. While that is technically what is happening, this result is achieved by essentially forcing much colder, low-pressure air into the space to force the warmer air to attempt to escape in a confined space; the eventual result is a cooled area. The distinction is slight, but your refrigeration isn’t actually removing warm air as much as it is adding a controlled stream of continuous colder air. In any case, this method of cooling the air varies dramatically from that of an air conditioner – AC actually treats and cools the air within each room, simultaneously removing warm air and replacing it with cooling air – making the refrigerator less efficient, even if it is more effective. Think of the inside of your refrigerator for a moment: It’s a small, nearly airtight space that is sheltered from light and insulated from the temperature outside of the refrigerator. Basically, the inside of your refrigerator is designed to keep the temperature inside stable with as little energy transferring as possible, meaning that even without a steady stream of cold air, your refrigerator should retain much of its chilled air for hours. Transversely, your home is relatively insulated, full of light, and features numerous doors and windows to let heat circulate in and out. Even if you did live in a tremendous, refrigerator-like environment, you’d need a ridiculous amount of energy to accurately control the temperature in a way similar to your fridge within such a large environment. These places do exist, largely in food distribution centers, but they cost a tremendous amount to cool. Your home’s air conditioning may not be capable of achieving sub-zero temperatures, but it does offer you a much more energy-efficient cooling method than your refrigerator does. Consider this: Your refrigerator’s interior is likely between 10 and 20 cubic feet, and costs somewhere between 350 and 1500 kilowatts of electricity to keep running throughout the year (when kept in a room temperature home), while your air conditioner, which is located in the far warmer exterior environment, would cost about 8 to 12 thousand kilowatts of electricity to run for a year (not excluding the winter months) for a 2,500 to 3,000 cubic foot home; this means that comparing AC to refrigeration, your fridge costs somewhere around 30 to 80 dollars per cubic foot per year, while your AC costs about 3 dollars. 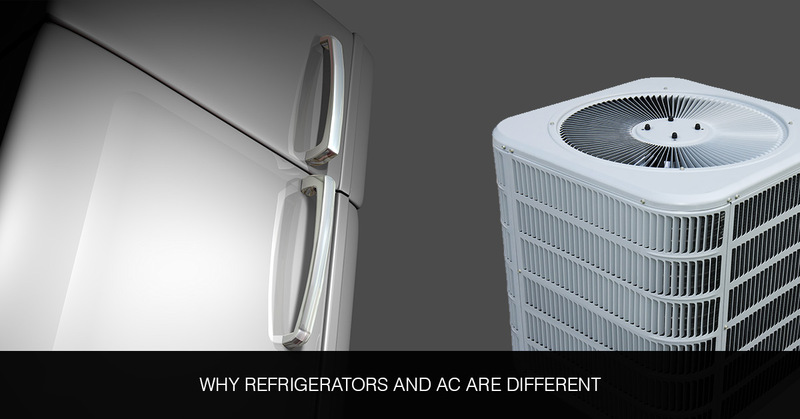 That difference is obviously tremendous, but excludes the lower temperature of the refrigerator as well as the relatively easier cooling it enjoys from being kept in an already-cooled home; in either case, the AC is far more energy efficient than your refrigerator – even your new Energy Star fridge. The above comparison uses the average cost per cubic foot of a relatively large home, if you were to upgrade that air conditioner to a newer, more efficient unit, the price could drop to two dollars per cubic foot, or perhaps even lower; likewise, if your air conditioning unit is over ten years old, it could be falling victim to the New Braunfels heat and jacking your costs up to closer to 5 dollars (or more) per cubic foot – yikes! The lesson to learn here is twofold: Even an outdated air conditioner is still more efficient than your refrigerator, but a newer model can be far more efficient and save you a variable amount on your summer energy bills. Regardless of your motivation, investing in your air conditioning increases the value of your New Braunfels home as well as your family’s comfort within it. With the climate we live in, upgrading your home’s air conditioner is often among the best benefits you can make!